There’s an intrinsic complexity to the relationships Batman shares with his many, colorful rogues. Within the confines of his mythology, there’s a pervasive motif of damaged people struggling to cope with various mental health issues which adds a layer of tragedy to even the most garish of water well poisoning or cartoonishly constructed jewel heists. Gotham City is a fun-house mirror Batman punches to numb his own considerable pain, and each rogue is a differently distorted shard, reflecting his fractured psyche back at him from a myriad of perspectives and tints. Nearly every villain he encounters, like him, is just one bad day that never ended. That’s Monday morning quarterback pseudopsychology, though. The truth is that each of his villains, on a meta level, were birthed for relatively random reasons, leaving subsequent creative teams over the years to retroactively assign emotional resonance to these interactions. The beauty of Batman mythology is that it’s mired in a rich, thematic depth that allows for such pop cultural hypotheses to hold more water than JMS’ awkward but noble “totem force” explanation for Spider-Man’s many animal themed foes. The notion that petty crime births the Batman and the Batman’s war on crime births super crime is a persistent one, and with good reason. It creates the constant moral quandary of whether or not Batman is complicit in the very plague he seeks to purge. Such is not the case with one Ra’s Al Ghul. Ra’s definitely fits the paradigm of a man forever changed by one extraordinary situation, vis a vis his first transformative foray into the Lazarus Pit, but that happened centuries before ever meeting Batman, much less the Gordian knot of criminal cause and effect that is Gotham City. Ra’s exists outside the equation, but still contributes to the mythology despite this. Out here in the real world, Denny O’Neil created Ra’s Al Ghul in 1971 for the very same reason Christopher Nolan would later hinge much of his take on the mythology on The Demon’s Head. Ra’s, being an international, James Bond style villain, removes Batman from his comfort zone of punching DSM IV entries disguised as Halloween costumes, and forces him into global scale action and adventure. He widens the aspect ratio on Batman’s world. Endowed with the gift and curse of near immortality and mania from his precious Lazarus Pits, Ra’s is a fiercely logical villain more in the mold of a Magneto or a Dr. Doom than The Joker. His very existence, an everlasting crusade to cleanse the Earth, reminds Batman that there is more evil in the world than just in his city, and it didn’t all start because he decided to put on a cape. What further set him apart from the rest of the rogues is his admiration for the dark knight. This isn’t the stalker ex-girlfriend obsession The Joker brings, or the wounded former friend thing Two-Face does. Ra’s hates having his plans foiled as much as the next megalomaniacal ecoterrorist, but there’s a glimmer in his eye with Batman, a sense of kinship. He respects Batman and sees in him a son he’s never had. I mean, he’s had sons, as countless retcons tell us, but none of them, you know, are Billionaire Vigilantes. 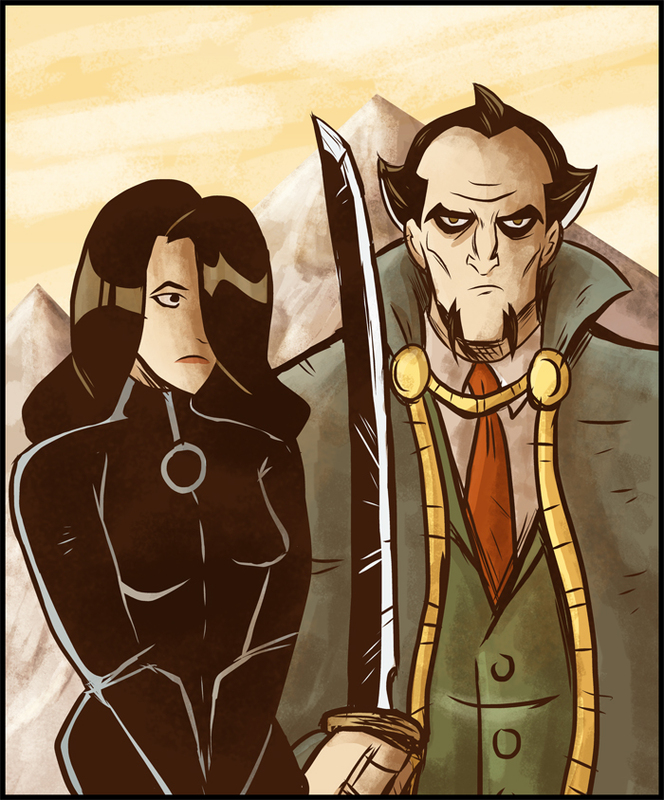 Ra’ Al Ghul is basically Meet The Parents inverted into something even more horrifying. What’s scarier than meeting the woman of your dreams and finding out her father is a paranoid psychopath? Perhaps trying to stop a guy from poisoning your entire city, only for him to endlessly chase you and beg you to fill his daughter with your seed. Perennially the rage fueled orphan, Batman had a father, and he was no fu manchu sporting arch villain. Whatever the particulars of Bruce’s eventual tryst with Talia Al Ghul might have been, there’s something haunting about a man so driven to destroy life wanting to align himself with Batman, an entity who exists solely to protect it. The sketchy Sith apprentice relationship he seems to desire so wholeheartedly in the comics (a very different beast than the one they actually share in the films) presents Ra’s as a unique adversary in Batman’s life. His allegiance shifting is not quite on the anti-hero level of Catwoman nor the passing fancy of Paul Dini’s later interpretation of the Riddler. The closest analogue one might find is in the world of professional wrestling, where the term “tweener” might best describe Ra’s circumstantial motivations, or I suppose “chaotic evil” for your more gaming enthused readers. The horror of their connection is something of a cautionary tale for Bruce. The Joker teaches him the dark side of grief unconsoled and Two-Face, the danger in justice unbalanced, but Ra’s shows him the true weight of fatherhood. An avid collector of wayward wards, Bruce Wayne is nothing if not a man quietly desperate for family, and those who fall under this blanket of comfort, protection and occasional accidental death are given a care and consideration as foreign to Ra’s as the the far away lands he travels. The Robins and Batgirls of the world may be soldiers in Batman’s war on crime, but they are also comrades, not the chess pawns in the way Ra’s treats his daughter. There is more to protecting something than callously manipulating it to your own ends, and more to raising an heir than furthering your own twisted legacy. Ra’s wants to better the world by bending it to his will and cleansing it of that which does not fit, where Batman seeks to protect that world, no matter the cost. Batman could never be Ra’s Al Ghul’s heir. The alternative would lead to some seriously effed up Thanksgiving dinners. Joe Hunter draws comics and stuff. He lives in Ohio. Please send a rescue party. You can find more of him on tumblr and on Twitter.